UW Head Football Coach Craig Bohl is impressed with Wyoming’s support for its university. When Craig Bohl became the 32nd head football coach at the University of Wyoming in December 2013, he was familiar with the Cowboy legacy left by legendary coaches such as Bowden Wyatt, Phil Dickens, Bob Devaney and Paul Roach. After creating a legacy of his own in 11 seasons as head coach of North Dakota State University—including three straight NCAA Football Championship Subdivision titles—Bohl was ready to meet the challenge of taking UW to the top of the Mountain West. 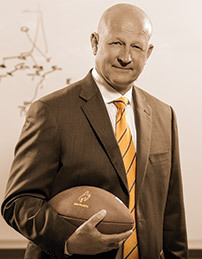 Bohl played football at the University of Nebraska from 1977–79 and earned his bachelor’s degree in business administration in 1982. The 2014 season is his 34th year coaching at the college level—12 years as a head coach, 19 as a full-time assistant coach and three seasons as a graduate assistant. Since coming to UW, Bohl has made it a priority to travel the state and meet with fans. He stresses that X’s and O’s aren’t the only things that lead to a successful program. Academics first: A small percentage of players ever make it to the pros, Bohl notes, which makes academics an even more important selling point to students. He says athletics provide experience for academic and career success. “Student-athletes are given a unique opportunity to manage their time because their time is more limited and, within that, to be more disciplined. “People of Wyoming are resilient, work hard and have a great value system," Craig Bohl says. "We’re going to have the same type of football team."